The New England Patriots’ pass defense has been a strength this season, with new arrivals Darrelle Revis and Brandon Browner keying coverage that has been stifling at times. Dave Archibald explores a potential weakness for the team entering Saturday’s playoff opener against the Baltimore Ravens. If the Patriots defense has an Achilles’ heel, look no further than their struggles to stop opposing tight ends, as Football Outsiders ranks the Patriots 30th in coverage against them. Three tight ends (Travis Kelce, Scott Chandler, and Coby Fleener) have set career highs in receiving yards against New England this season. How might Baltimore seek to exploit this potential flaw? The Patriots have used a variety of players and schemes to find a combination that slows the opposition. Linebackers, safeties, and even cornerbacks have defended tight ends in both man-to-man and zone coverage. New England defenders have pressed, played off, and jammed tight ends at the line. In a promising development for Patriots fans, there has been some modest improvement in recent weeks. After allowing 71 yards per game and 8.8 yards per pass attempt to tight ends through Week 11, opposing tight ends have averaged just 49 yards in the following six games at a substantially improved 6.7 yards per attempt. Strong safety Patrick Chung has drawn by far the most man coverage assignments against opposing tight ends. Opposing quarterbacks targeted a tight end Chung was covering 31 times – only free safety Devin McCourty also cracked double-digits (11). Against Chung, tight ends caught 15 of 28 (54%) of official targets for 183 yards (6.5 yards per attempt), with three touchdowns and three plays wiped out because of penalty. We wrote previously about Chung’s strong performance against the Denver Broncos, highlighting many of the positives and negatives of his game. On the Patriots’ 20-yard-line, the New York Jets line up two tight ends right with Jeff Cumberland inside. The Patriots walk both safeties up close to the line of scrimmage, with Chung positioned across from Cumberland at linebacker depth. The Jets sell a zone run fake right and Chung gets caught taking a step in the wrong direction. Cumberland runs past him up the seam for the easy touchdown. Chung has gotten less work against tight ends of late, targeted just eight times in man coverage over the past six games, but that’s still tops on the Patriots over that time period. 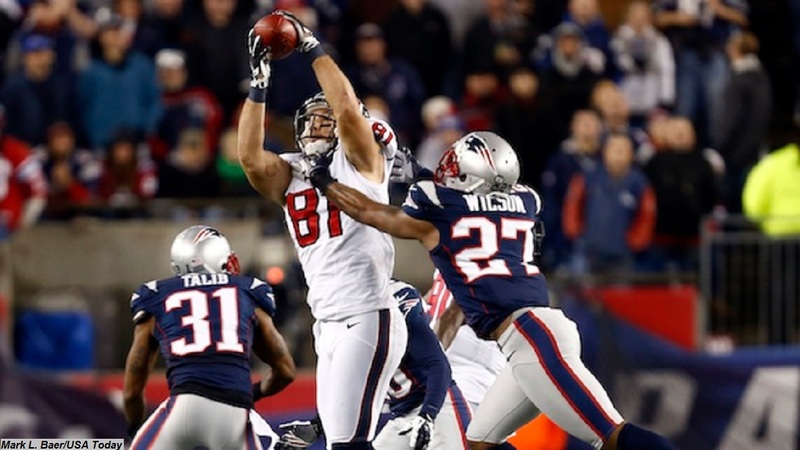 He expects to figure heavily into any plans to neutralize opposing tight ends in the playoffs. McCourty does most of his work in the deep zone, but, as noted above, he was second on the team in targets covering opposing tight ends. The Patriots matched him up against Antonio Gates of the San Diego Chargers and Charles Clay of the Miami Dolphins, two tight ends known more for their pass-catching prowess than their blocking skills. In 3rd-and-long situations, the Patriots will sometimes take Chung off the field and insert free safety Duron Harmon, with McCourty sliding to strong safety to defend a dangerous receiving tight end. This is New England’s best option to shut down a tight end, but it correspondingly weakens the defense up front against the run and on the back end, and will likely remain a contingency plan. For more on McCourty’s work in man coverage, see Brian Filipiak’s article breaking down the subject. Just before the snap, Fleener motions inside of slot receiver T.Y. Hilton. Browner is matched up on Fleener with Kyle Arrington defending Hilton. Fleener runs up the seam, angling slightly towards the middle of the field and then cuts out toward the sideline. Hilton runs a cross toward the middle of the field and, when Hilton and Fleener cross, Browner and Arrington get tangled up. Browner ends up seven yards from Fleener as the tight end catches the ball, leading to an easy gain for the Colts. In total, Browner has allowed six completions to tight ends on eight targets for a whopping 131 yards and a touchdown. The Patriots have clearly moved away from using Browner in this fashion as he has not been targeted since the Colts game, and it seems unlikely he’ll play a big role covering tight ends in the playoffs. Clay lines up tight right and runs straight down the seam. Collins doesn’t get a jam on him and doesn’t get a lot of depth in his drop; neither does Hightower, lined up next to him. McCourty is the only safety deep, so he plays way off – more than 25 yards from the original line of scrimmage. This creates a huge window for the connection between Dolphins quarterback Ryan Tannehill and Clay. Offenses can prey on the holes in zone defenses, especially in the short and intermediate ranges. However, zone is less vulnerable to big plays than man-to-man. The Patriots allowed completions on 68% of passes to tight ends when using zone defense versus 63% for man, but for an average of only 11.2 yards per completion versus 13.3 for man. Their zone defense didn’t allow a touchdown in 47 attempts, while they allowed seven in 78 man-to-man coverage targets. The Patriots have trended more towards man-to-man defense against tight ends as the season has gone on – in their final six games, New England targeted TEs just 13 times with zone defense compared to 33 times with man-to-man – but zone coverage will continue as part of the portfolio when it comes to defending tight ends. The Patriots will sometimes line up an edge player on the tight end, usually defensive end / linebacker hybrid Rob Ninkovich, and have him jam the tight end at the snap before rushing. This can disrupt the timing of the passing route and make it easier for a safety or linebacker to pick up the tight end. By jamming at the line and then having a different player cover, the defense can also create confusion over who is covering the tight end and who is rushing. The Chargers line up Gates in the slot right, and Ninkovich follows him. Ninkovich puts his hand in the dirt like a defensive end, but he’s aligned much wider than a typical end. He rushes the quarterback, but first takes a shot at Gates as he starts his route. The tight end does get open underneath, but zone defenders Collins and Jonathan Casillas close quickly, holding Gates to a four-yard gain. With future Hall of Famer Gonzalez split out wide, the Patriots dedicate two linebackers, Collins and Jerod Mayo, to keep him from even starting his route. This takes two defenders to neutralize one offensive player, which is unfavorable math, but since Gonzalez had 12 catches for 149 yards and two touchdowns at that point, desperate times called for desperate measures. The Patriots may not face a tight end that dangerous in these playoffs, but they’ve got a contingency plan if they do. On Saturday the Patriots face Baltimore’s Owen Daniels, who at 6’3” and 245 pounds is on the smaller side for the position, much like Clay, Cumberland, and Tamme. It seems likely the Patriots will use Chung on Daniels quite a bit, and possibly McCourty in obvious passing situations. When the Ravens use two-tight end sets, the Patriots may call on reserve safety Tavon Wilson, who was effective against Daniels in 2012. Undoubtedly they will sprinkle in some zone coverage as well, particularly with the linebackers. No matter who they’re facing, the Patriots won’t do just one thing. New England has struggled at times this season defending opposing tight ends, but the Patriots have a variety of options, and won’t hesitate to mix things up as the situation dictates.